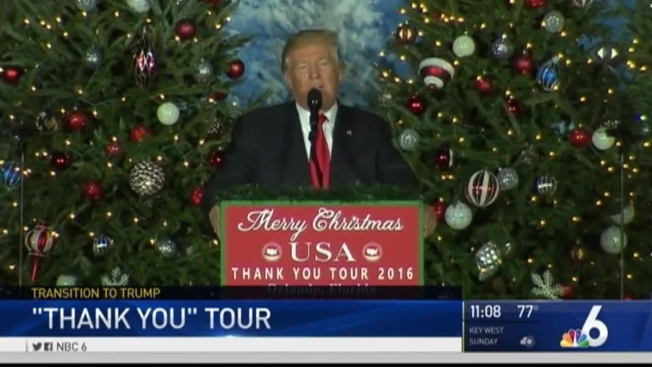 President-elect Donald Trump, in the latest stop of his victory lap, told a military veteran-laden crowd in Florida on Friday that while he would build up the country's armed forces, he would use them sparingly as commander-in-chief. "For too long, we've moving from one reckless intervention to another, to countries you've never heard of before," Trump said at a rally in Orlando. "It's crazy and it's going to stop." Trump still vowed to defeat the Islamic State group, offering no details but promising a foreign policy strategy that "means crushing ISIS rapidly." He also vowed to keep "radical Islamic terrorists" out of the country by banning immigration from regions afflicted by terror — and pledged that tragedies like June's mass shooting at a nearby Orlando nightclub, which left 49 dead, would never happen again. That shooter was a U.S. citizen born in New York and would likely have been unaffected by Trump's proposals. 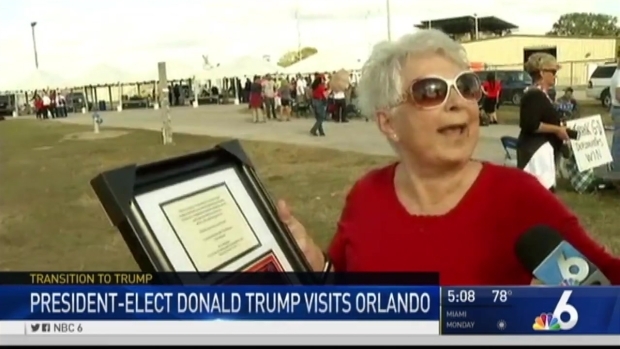 NBC 6's Michael Spears reports from Orlando on the Thank You door hosted by Donald Trump. Trump on Friday also selected South Carolina Rep. Mick Mulvaney, a budget hawk and conservative Republican, to be his budget director, according to a transition official not authorized to speak publicly about the decision before it was announced. 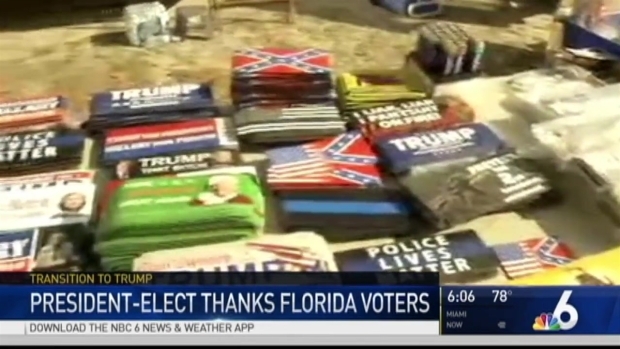 The stop in Florida, which drew thousands to a fairgrounds outside Orlando, was meant to salute Trump's Election Day victory in a must-win state for his upstart presidential bid. The Republican businessman, who owns multiple properties in Florida, calls it his "second home" and relentlessly campaigned across it, successfully turning out white voters from non-coastal areas to best opponent Hillary Clinton's strength among minority voters in the state's large cities. On Saturday, Trump will make the final stop on his "Thank you" tour at a football stadium in Mobile, Alabama, revisiting the site of the largest rally of his campaign. That night, he will return to Mar-a-Lago, his palatial Palm Beach estate. Aides said the president-elect would likely spend all of Christmas week there, taking meetings and relaxing with his family, and could stay at the coastal resort until New Year's. The raucous crowd — which was double in size of the one in the same venue in late October — also acted as if the campaign was still ongoing, repeatedly chanting "Lock her up" about Trump's former Democratic foe Hillary Clinton. They also turned their scorn on the press pen, chanting "Move them back" when Trump bitterly noted that the reporters at the rally had better seats than most of the attendees. Donald Trump will depart New York for a rally in Orlando, Florida, saluting his Election Day victory in what was a must-win state for his upstart presidential bid. Trump's pick to head the Office of Management and Budget helped found the House Freedom Caucus, the group of conservative lawmakers who frequently battled former House Speaker John Boehner. An early backer of Trump during the campaign, Mulvaney took a hard line on federal spending under the Obama administration. A strong proponent of spending cuts, Mulvaney fought against raising the nation's debt limit and frequently expressed a willingness to shut down the federal government instead. Mulvaney, as budget director, would be tasked with steering Trump's promised tax cut and infrastructure investment as well as working to repeal the Affordable Care Act. In Orlando, Trump pushed back against criticism that his Cabinet was too stocked with generals and billionaires, suggesting he only cared about effectiveness, not political correctness. "I don't need an MBA at the border and I don't need a general negotiating our trade deals," he said. Though he will now set up camp at Mar-a-Lago, he has conducted most of his Cabinet and White House interviews from his office in Trump Tower high above Manhattan. Those interviews, as well as meetings with his advisers, continued Friday morning and included a sit-down with Homeland Security Secretary Jeh Johnson, the only current member of President Barack Obama's Cabinet to make the trip to the tower. Also on Friday, Trump's incoming staff — Reince Priebus — had lunch at the White House with President Barack Obama's current chief of staff, Denis McDonough. Other former chiefs of staff were also invited. Meanwhile, three protesters who have sued Trump, claiming they were assaulted last March at one of his campaign rallies, are asking the president-elect to sit for a deposition before he takes office next month. Trump's attorney says he intends to "oppose any efforts" to depose the president-elect.